Xylene is compound chemical that has multiple uses in the industrial world. Xylene is used as a solvent, paint thinner and coating for medical supplies, such as sutures. The chemical can leave residual traces even after it has been washed away from an object, which can be passed on to human hands and can be dangerous if ingested. 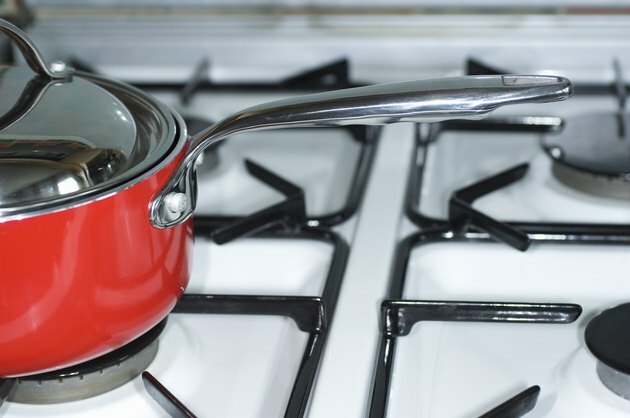 Heat is the best way to remove xylene traces from objects, and this can be achieved with either a stove or an oven. Fill a pot large enough to hold your xylene-covered object with water. Bring the water to a boil; the goal is to reach a temperature in the water above 100 degrees F.
Submerge the xylene-coated object in the water, and allow it to boil for as long as possible, at least one hour and up to four hours. Allow the object to air dry overnight in a warm area. The hot water followed by exposure to warm air will help to eliminate xylene from the surface. For a different method, continue to Step 4. Bake the xylene-soaked object in an oven set at 140 degrees F. for as long as possible, up to six hours. Allow the object to cool completely before replacing it where it belongs; the heat of the oven will eliminate xylene from the surface.